Now that it’s spring, it’s maybe time to make my base look lighter and more natural in day light… goodbye for now heavy foundation. I’ll see you soon. I still want my face to look as flawless as possible though, so don’t worry – not embracing the no-makeup look. 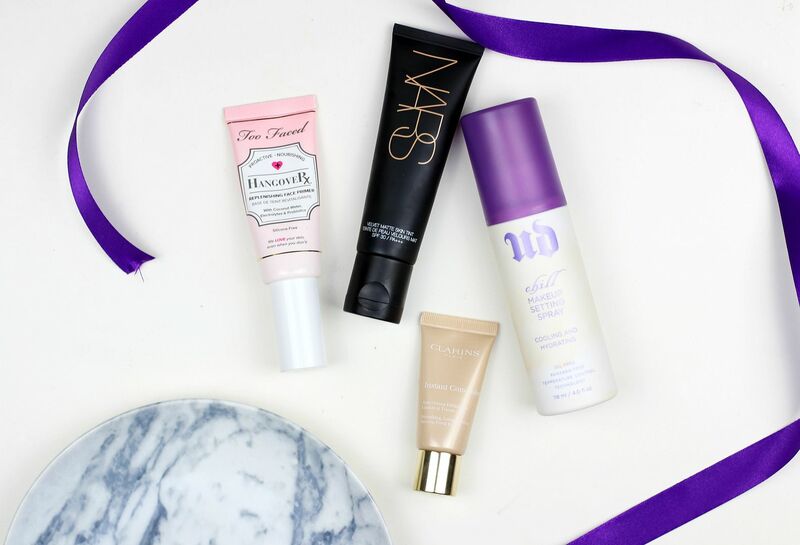 My primer of the moment is the Too faced Hangover primer – I find my makeup sits so nicely on top of this. It’s been balancing my skin and helping everything stay hydrated so my skin isn’t getting oily on my nose as well – it’s magic. It doesn’t blur pores, but just smoothes skin and makes any foundation apply more nicely. Oh, Too faced, you’ve done it again. I did it. I finally bought the Nars velvet matte skin tint after deliberating over it since it launched. I was put off by the fact that it claims to be sheer and matte but it’s actually got really good coverage and looks more natural rather than mask-like and flat. It’s not the longest lasting product in the world, but I like the way it looks my skin look… Like myself. I’m on my third tube of the stuff, and I still love it… the Clarins instant concealer. It’s really perfection for dry skin, and brightens up the under eyes. Lastly, let’s talk about the Urban Decay chill setting spray. Its sister, the all-nighter spray, gets all the attention but the chill spray is the one. It sets your makeup perfectly and makes it last longer but it also gives skin a big hit of hydration. Plus, it does actually feel cooling on the skin.